To mark the 20th Anniversary of Global March Against Child Labour (Global March) as well as the World Day Against Child Labour, Global March and the International Labour Organization (ILO) organised a joint event on 4 June 2018 during the International Labour Conference (ILC) at the Palais des Nations, Geneva. The event, in the form of a panel discussion, saw the participation of dignitaries and panellists including the ILO Director-General, Mr Guy Ryder; Nobel Peace Laureate, Mr Kailash Satyarthi; the youngest core marcher of Global March Against Child Labour, Basu Rai; former child labourer in agriculture, Zulema Lopez, as well as Sue Longley, General Secretary of the International Union of Food, Agricultural, Hotel, Restaurant, Catering, Tobacco and Allied Workers’ Associations (IUF) and Nazrene Mannie, from the Board of Business Unity in South Africa. The event began with showcasing a video on the historic Global March Against Child Labour of 1998 along with the 20 years of journey of Global March as well as a Virtual March Against Child Labour that was organised by Global March throughout the month of May 2018 on Facebook and Twitter. The Virtual March raised awareness on child labour to advocate for the universal ratification and implementation of the key child labour Conventions, i.e ILO Conventions Nos. 138 and 182, as well as the achievement of SDG Target 8.7. It mobilised voices across different online platforms through diverse mediums on this issue, engaging stakeholders such as children, youth, employers’ and workers’ organisations, influencers, parliamentarians and civil society, among others and reached 858000 people on Twitter and 206000 on Facebook across 4 continents of the world. The video ended with a strong appeal that only 7 years are left to achieve the SDG Target 8.7 to end child labour by 2025. Following the video of Global March, ILO’s video on hazardous child labour was also played for the audience which set the mood for the event. The panel discussion started with introductions of all panellists and a key note address from the founder of Global March Against Child Labour and Nobel Peace Laureate, Kailash Satyarthi as well as the ILO Director-General, Guy Ryder. As there has been almost no reduction in the number of children aged 5 to 11 in child labour, and the number of these most vulnerable, youngest children in hazardous work has actually increased, Mr. Satyarthi pressed for coordination between different ministries and departments such as that of education, labour, finance etc across all governments of the world. He further reminded the audience that if we need to end child labour we must invest in education and if education for all needs to be achieved, child labour must be eradicated. Several delegates held back tears as Zulema Lopez, a former farm child labourer from United States of America recounted her days as a child labourer in her country. Nazrene Mannie, from the Board of Business Unity in South Africa, highlighted the difficulty of tackling child labour when it takes place in family farms or enterprises, often hidden from public view. She asserted that much of child labour in agriculture takes place in family farms and it is incredibly difficult to reach these children. The panel discussion ended with Mr. Satyarthi’s urgent appeal to all the guests and government representatives and other stakeholders present, that the issue of child labour needs urgent attention. He said that the issue of child labour is personal to him and the same personal attention must be given to it by all stakeholders. Ending child labour is urgent and it is possible. 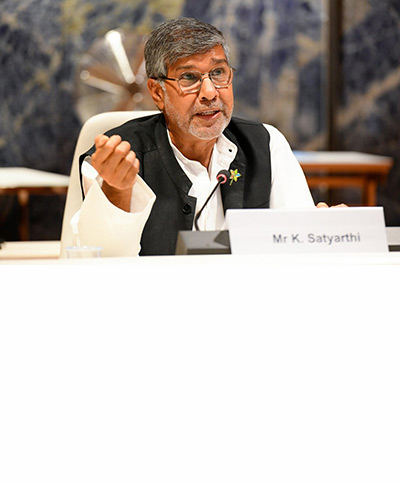 In the afternoon of 4th June, a Facebook Live was also conducted with Mr. Satyarthi, Basu Rai and Zulema Lopez on what has been achieved since 1998, which was followed by revisiting the historic monument of Global March Against Child Labour placed in front of ILO-Headquarters in Geneva. Mr. Satyarthi was also then invited to unfurl a new installation placed at the premises dedicated to child labourers. The eventful day of 4th June concluded with the screening of the documentary film on Mr. Satyarthi’s life, a Sundance special Jury award winner, KAILASH. We at Global March Against Child Labour would like to extend our heartfelt gratitude and thank you to all our supporters who have been supporting our work since 1998 as well as those who contributed to the Virtual March Against Child Labour. Our commitment to end child labour only strengthens with your kind support.